Most jobs have peaks in their work flow and stress points during the year. For forest nurseries it's the winter months when everyone wants lifting and dispatch of tree stocks pretty much all at the same time. 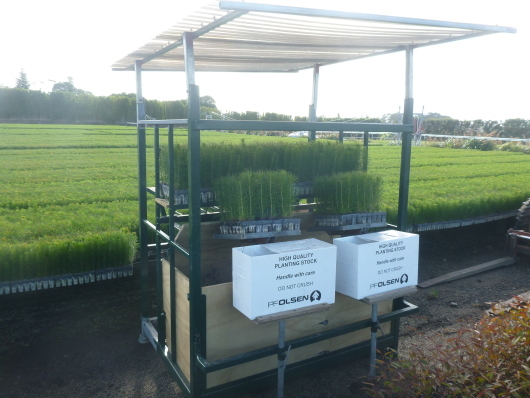 This is where some of the less-known benefits of a containerised nursery versus a bare-root happen. One of these benefits for the staff is cleanliness. This may sound strange but staff are able to wear standard clothes and go home relatively clean after a day of grading and packing trees stocks. 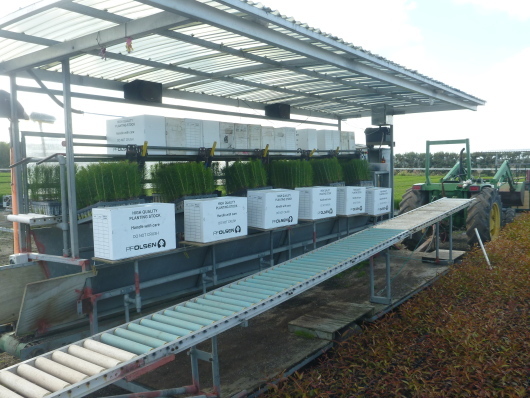 While a bare-root worker will be kneeling, or bent over, often in muddy, cold and wet winter conditions, PF Olsen Nursery staff have an ergonomic layout with the packing process set up in front of them at a comfortable height. They are out of the rain and can listen to music. This helps with staff recruitment and retention, as well as long-term productivity. This was all possible with the development of a lifting machine a few years ago called Colin (hint, think trees and celebrity for the connection). This machine semi-automated the process of packing, reducing the workforce by half, while still doubling the trees packed in a day, this giving a 200 % increase in productivity. Colin also reduced the risk of strain injuries through the adjustable layouts to suit each person. Colin (big) has increased tree stock lifting, grading and packing productivity by 200% as well as significantly improving working conditions. Colin has been a great asset over the years for completing large orders but we have always struggled with small orders due to the size and cumbersome nature of Colin. Over the summer the nursery manager, Kevin Haine, built a smaller version to increase the responsiveness of the nursery to small orders. Already this season, small-Colin (unnamed as of yet) has proved its worth. When an order was increased at the last minute, small Colin was quickly deployed to pack a few more boxes while the truck was being loaded so the increased order could all go out at the same time. All while Colin and the rest of the staff were continuing to pack the next forest owner's orders required for that day. Small Colin has already proved its worth in increased flexibility … but needs its own name! If you have a great name for small-Colin email it in and we will send the winner their choice of 100 eucalyptus, Tasmanian Blackwood or Radiata pine tree stocks.